More Looney Tunes...your wish is our command. 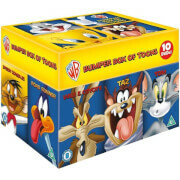 In this 4-disc set are 60 more of the most looneytic Looney Tunes ever unleashed and over 5 hours of extra special features. Indeed, some have never before been on home video! Disc 1 features some of the best Bugs and Daffy shorts ever. Disc 2 is filled with Looney Tunes version of fairy tales. Disc 3 features the best of Looney Tunes directed by Bob Clampett. And Disc 4 is all about the early daze.